If you’re below 14th Street, I can tell you where to get the best coffee in the East Village. Travel a few blocks further below East Houston and that dividing line takes you to the Lower East Side, where coffee shops also shine. 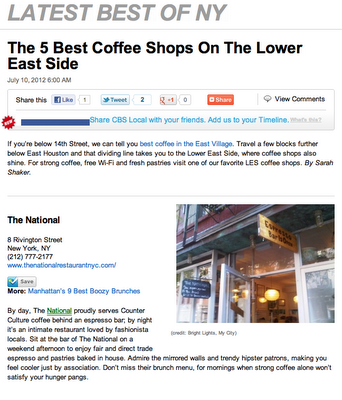 For strong coffee, free Wi-Fi and fresh pastries visit one of these favorite LES coffee shops. The National is my place when I visit my daughter in New York city. I LOVE The National, they make the most delicious iced coffee!